For some reason, Amazon founder and CEO Jeff Bezos is an extra in the upcoming Star Trek movie. 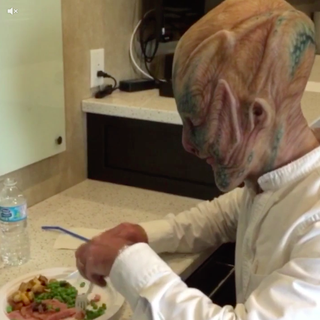 And, for some reason, Jeff Bezos has uploaded a Vine of (presumably) himself, eating what appears to be some kind of meat, pea, and potato dish. Then, Bezos, who is worth almost $60 billion dollars by the way, drinks out of a water bottle though a straw. Huh. This is a pretty good first vine from Jeff, particularly the alien head, but he can certainly do much better. I’m going to give this a 5/10.